Well, the first full business week of 2015 is nearly in-the-books. How are you doing with those risk management resolutions of yours? Holding steady? Or do you need a pep talk? If it’s the latter, my Twitter feed is here to help. That’s because a number of my fellow AEC twerps had risk management, including successful project management, on the brain this week, and I’d like to use the Friday Forum to share some of their unique insights. The author goes on to argue that risk can only be managed when it’s properly understand, which makes thorough data gathering and analysis a vital precursor to effective action. Chris’s tweet links to his March 15, 2010 blog post with valuable tips for running a construction project smoothly. That post, in turn, links to a white paper authored jointly by the Associated General Contractors of America (@AGCofA), the American Subcontractors Association (@ASAUpdate) and the Associated Specialty Contractors entitled Guidelines for a Successful Construction Project. If you’ve never seen this resource before, you should take a peek. Its 80 pages are chock-full of advice on successful project execution, covering such topics as project relationships, effective project communications, best practices for change orders, proper scheduling, your rights and responsibilities in the payment cycle, and so much more. Mandatory reading for project executives, managers and supers. What about you? How do you intend to minimize risk and maximize profits in the year ahead? Don’t be shy — share your wisdom by leaving a comment below. 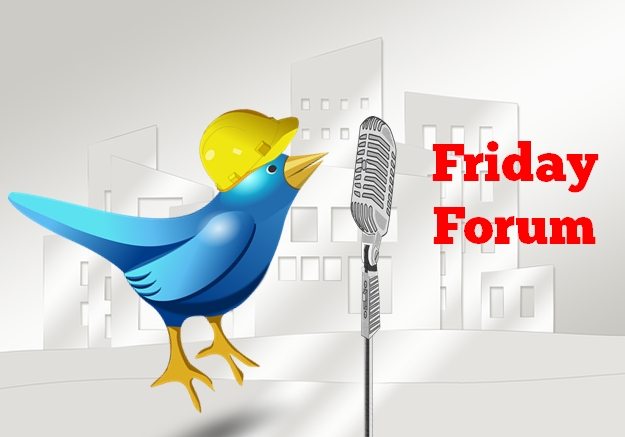 That’s what the Friday Forum is for — and the microphone is all yours. You are right, not making informed decisions, more than often, is the primary reason behind a failed construction project. Risks must be taken into account, respected and properly planned and managed. Thanks for that wonder resource about the construction project!